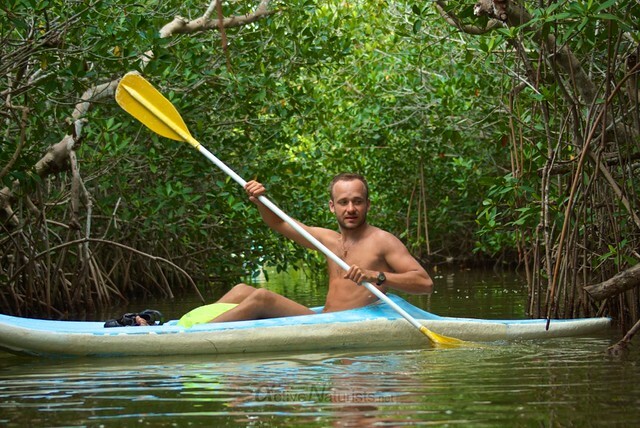 Thanks to having a local with us, we quickly figured out an alternative to naked sailing in the open sea – kayaking in mangroves! Luckily, La Ria, eco-touristic centre in Progreso, was right nearby, and and there was also a bus line that could easily bring us back to Merida. 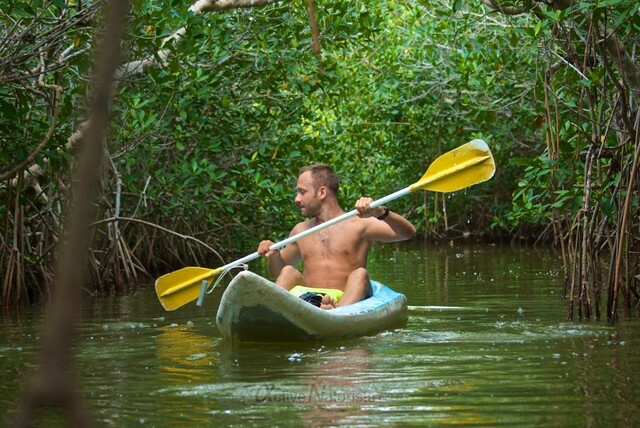 We rented single kayaks, as those were easier to manoeuvre judging by my previous experiences in Long Island Sound, which was even more important for passing through channels in mangroves. Those narrow ‘trails’ were actually quite tricky to paddle through, as the oars were just too long to move between the mangrove trees. We discovered that the best way to move forward was to simply push branches above us with hands; that is probably the closest we can to the state of a monkey leaping from one tree to another. 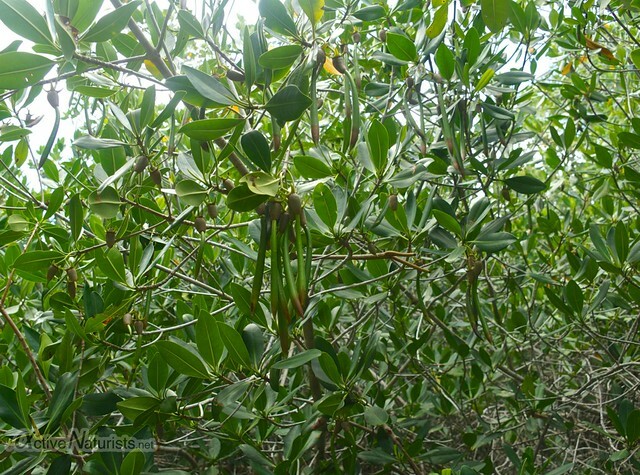 It was nice that the first part of the trail went in the middle of dense mangroves, so that we stayed in their shade while the sun was high. 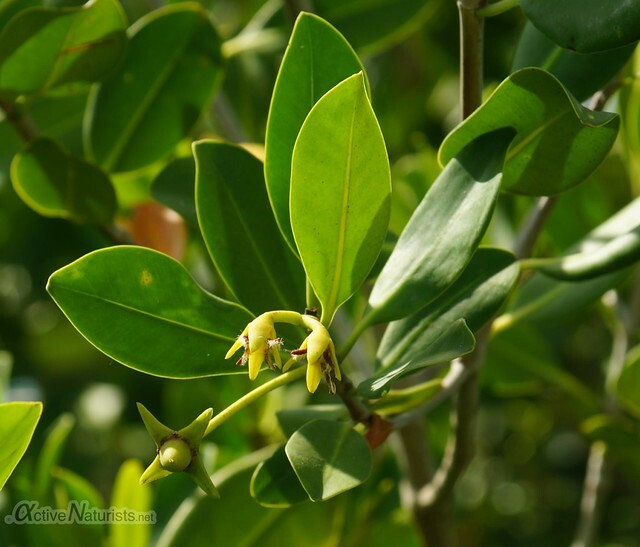 There were different species of mangrove trees that had various adaptations for living in saline tidal waters. 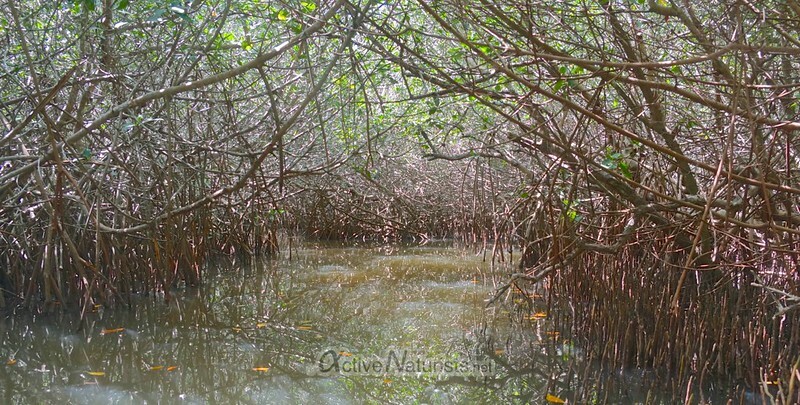 Red mangroves (on the left of the photo below) use stilt roots to keep the rest of the plant above the high tide margin, while black mangroves (on the right) us pneumatophores (specialised root-like structures which stick up out of the soil like straws) to deliver oxygen to the root system. Many trees were full of fruit and blossom, though the latter is not very noticeable. 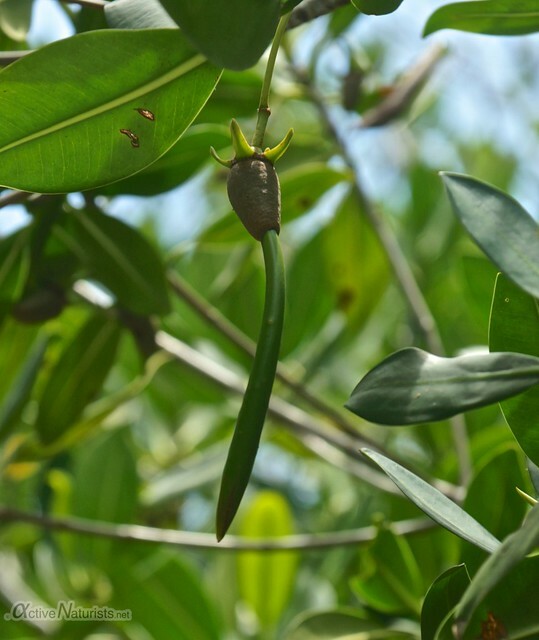 It is actually quite amazing that the seeds of many mangrove species germinate while still being on the parent tree – it is probably the best plant equivalent of pregnancy! When the seedling is mature enough to travel, it falls into water and floats until it finds suitable conditions to lodge in the mud and root. 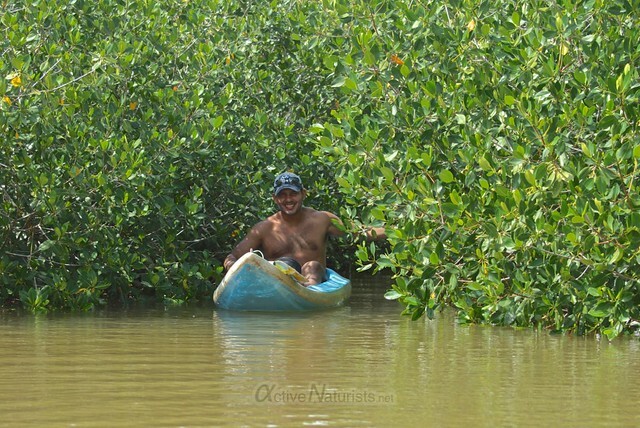 After ‘crawling’ through the mangroves, it was relieving to emerge into open water! 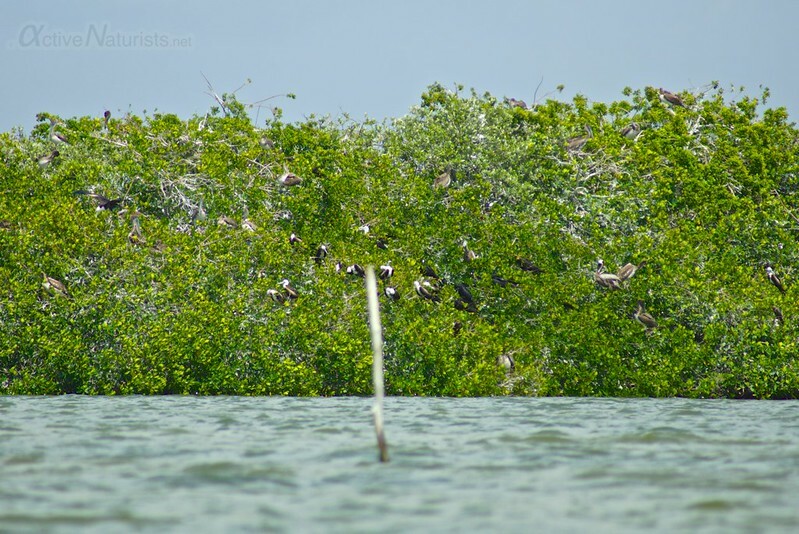 Our next goal was to find an islet with shorebird colony. The guide from La Ria told us about it, but unfortunately they didn’t provide any maps to take with us, because “they would get wet”. After a bit of wandering, we finally saw it! 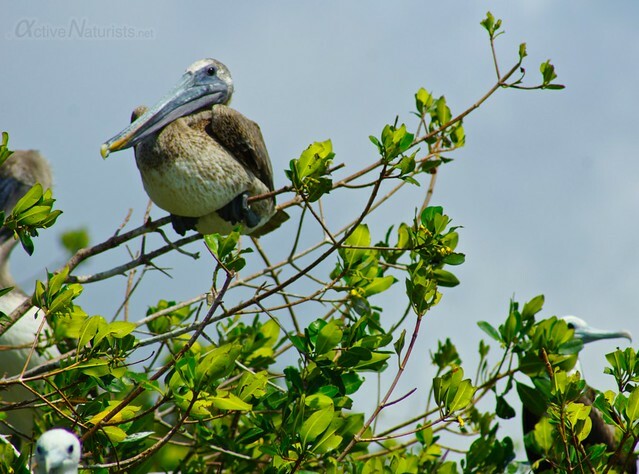 It looked like any other island around but was chosen by dozens and dozens of various shorebirds for nesting. 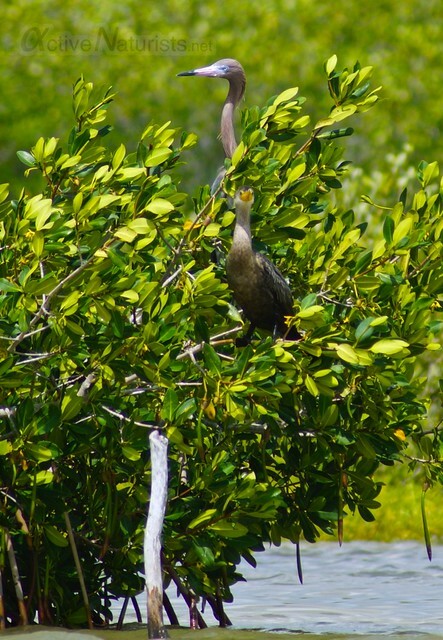 After that, we checked out a couple of other channels in mangroves. One of the trails seemed particularly promising but it didn’t lead anywhere. 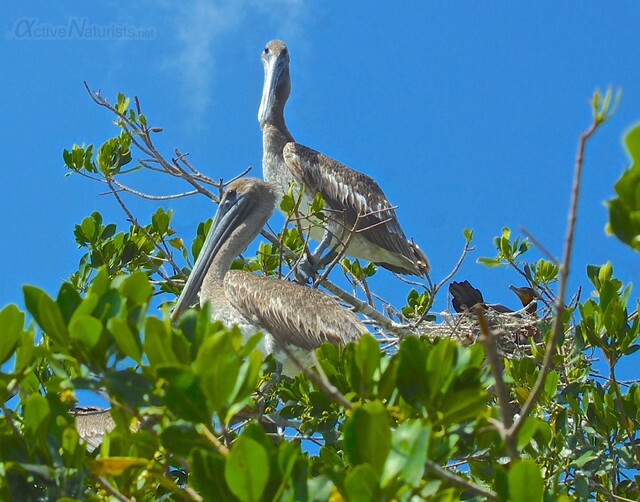 Upon return to ecolodge, we chilled in the shade and had a delicious seafood lunch. So the day didn’t go quite like we had planned, but obviously we had no regrets! 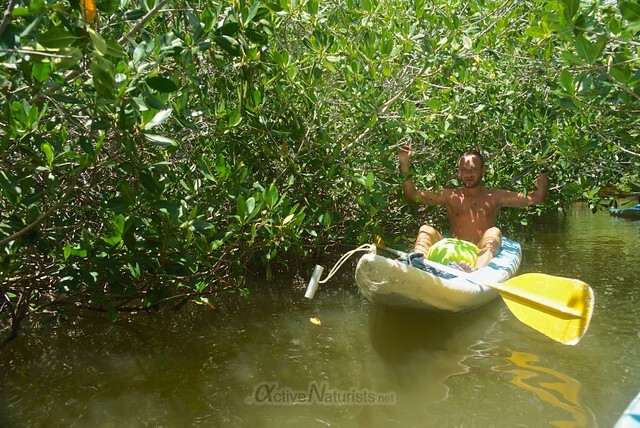 Kayaking in mangroves is so much fun! 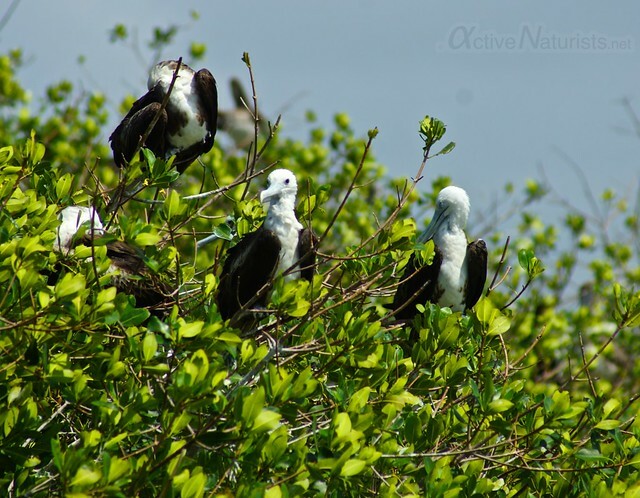 Previous postbeaches of Sian Ka’an biosphere reserve, natural and naturist? Next postWorld Naked Bike Ride, NYC edition 2013, is on Saturday, 8 June! 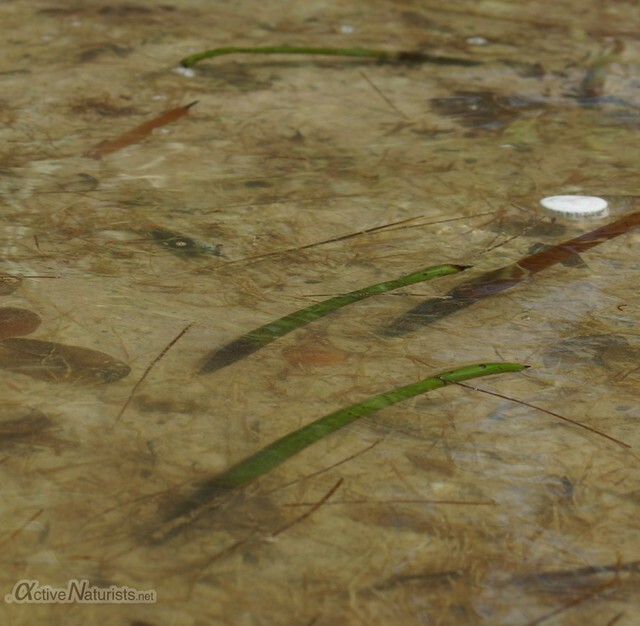 Moving hand over hand sounds a lot like some of my paddles through channels in cat tails. 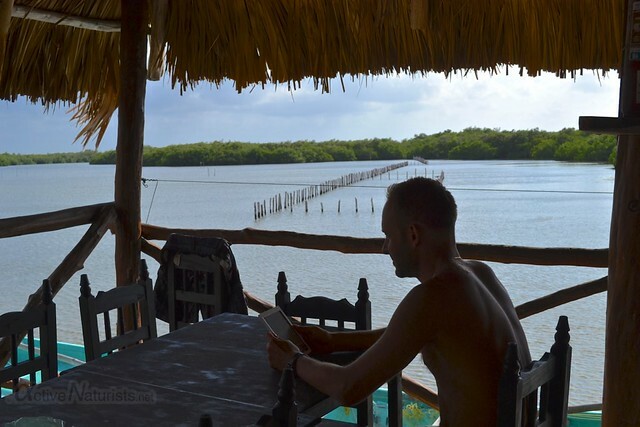 Spent three months in the Progresso area, actually just to the west, and found many pleasurable hours wandering through the swamplands with camera in hand – a good way to be active and a naturist in Mexico. I wish I would have thought of Kayaking. J’apprécie l’information, les détails de cette aventure. Est-ce que ton guide était nu lui aussi?